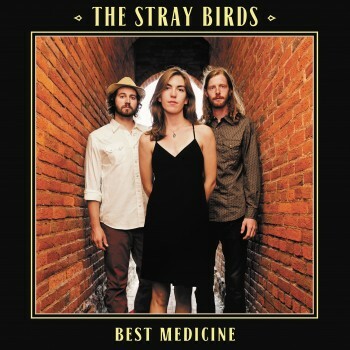 We’re incredibly excited to release Best Medicine – the Yep Roc debut for The Stray Birds. Best Medicine is now available on CD/LP at the Yep Roc Store and on iTunes. Two years, hundreds of gigs, and thousands of highway miles after The Stray Birds’ self-titled debut album was released, the genre-melding acoustic trio prepares to make its Yep Roc Records debut. Known for their songwriting, instrumental virtuosity and gorgeous three-part harmony singing, Best Medicine is their most cohesive and ambitious album to date. The band – multi-instrumentalists and vocalists Maya de Vitry, Oliver Craven, and Charlie Muench – hails from Lancaster, Pennsylvania. All three are classically trained musicians who’ve been making music of all kinds since childhood (before they reconnected through the local music scene, de Vitry and Muench first met in middle school orchestra); however, they were also all raised with a steady diet of music ranging from pioneers like The Carter Family and Bill Monroe & His Blue Grass Boys to the joyous invention of The Beatles and The Band, to the groundbreaking artistry of Jimi Hendrix.